Glencolumbkille in Ireland-North is a perfect choice for a great holiday or a fun short break in County Donegal. Find out more about Glencolumbkille below. Located just 1 mile outside the quiet picturesque village of Glencolumbkille, with its pubs and folk village, lies this adorable traditional cottage. Compact in size but big on charm. It sits overlooking the sea with its own private access path down to the beach. It is perfect for couples (access to the bathroom is through the bedroom), or simply ideal for artists or writers who need a quiet escape. This makes a great touring base for the Northwest of Ireland and the rest of the Donegal coast with the Slieve League Cliffs and many coves and beaches. There is a choice of mountains to explore as hill walking is one of Donegal's main activities.Shop. Pub. Restaurant 1 mile. Beach 80 yards. GF: lounge/kitchen/diner, shower room. FF: kingsize double.Electricity included , oil filled radiators, wood burner with starter pack, linen and towels included, TV, CD, fridge with small ice box, microwave, ipod docking station, hairdryer, uk tv channels, welcome pack, partially enclosed garden, sitting out area, picnic bench, bbq, private off road parking. Sorry no pets. We have the following details listed regarding Glencolumbkille accommodation accessibility but we would recommend that you always confirm these prior to booking with the owner or operator. Glencolumbkille is a great base to explore the wonders of County Donegal and you will find plenty of activities near by. Glencolumbkille is at killybegs, County Donegal. Check out the map below for directions, use the controls to zoom in. If you have stayed at Glencolumbkille why not add your thoughts, comments, pictures to our Facebook page? Don't forget to add the name/town/page link to your comment so its attributed to the correct place. Please keep it polite, we are sensitive souls! Find Cottage Holidays works closely with independent cottage owners and leading holiday travel operators to provide you the widest choice of self catering accommodation across Ireland. 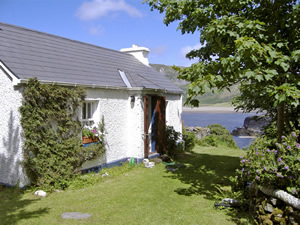 Glencolumbkille in County Donegal is available through: Imagine Ireland. Imagine Ireland is Europe's leading self catering specialist. As the fastest growing holiday company in the UK it prides itself on its quality, high standards and exceptional service. Imagine Ireland checks and inspects each and every one of its properties. Only half of all properties inspected reach Imagine Ireland's tough quality standards and are therefore included in their portfolio. If you are heading to County Donegal then check out our guides to local holiday attractions, gardens to visit and county shows to see.